Inmyel | Soup up your weekly meal plan. Soup up your weekly meal plan. 02 Sep Soup up your weekly meal plan. There are many varieties of canned soup available that are tasty and good for you. But, nothing beats a bowl of piping hot homemade soup. Here are 5 main reasons why you should make homemade soup. 1. Many soups are easy to make and do not require a ton of time. Soups with meat or poultry can be made in very little time if starting with leftover cooked beef or pork or a store bought cooked rotisserie chicken. 2. Soups are versatile and can serve as an appetizer, a complete meal or alongside a sandwich for lunch. 3. The ingredients in soup can easily be modified to suit your preferences. For example, if you don’t like kidney beans in Minestrone soup swap it with a different type of bean. 4. Many varieties of soup can serve as a well-balanced meal made up of colorful vegetables, complex carbohydrates and lean protein. Making homemade soups puts you in the driver seat of what ingredients and how much of each to use. 5. Many soups are suitable for freezing and make for a convenient heat-and-eat meal for a lunch or quick dinner. Instead of making a large batch of soup and eating the same soup for days, enjoy for a day or two and freeze the rest for a day when you are pressed for time. 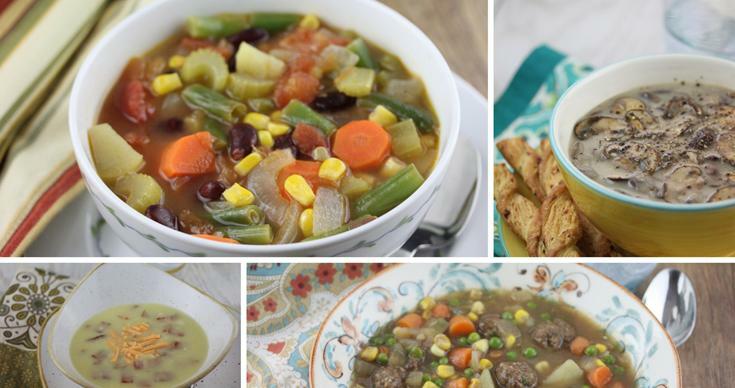 Add homemade soup to your weekly meal plan and you will be glad you did.